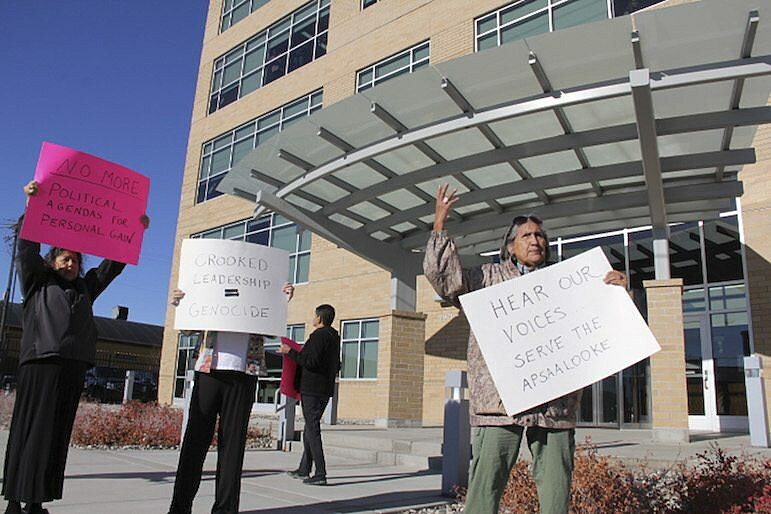 Crow tribal members protested in front of the Billings office of the Bureau of Indian Affairs this week, asking for a say on decisions being made by the executive and legislative branches of the Crow Nation. Backed by a handful of nontribal supporters, about 20 Crow Indians gathered on the sidewalk in front of the building at 2021 Fourth Ave. N. that houses the BIA’s Rocky Mountain Regional Office. 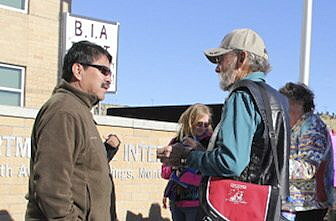 Chris Finley, a retired National Park Service archaeologist who worked on the Crow reservation for many years, helped organize the protest with Peggy White Wellknown Buffalo, who said she was removed from the 107th District Council of Elders for questioning the actions of Tribal Chairman Darrin Old Coyote and other tribal leaders. Finley said they were in Billings only to protest, not to seek an audience with anyone from the BIA. As we reported Wednesday, some tribal members were upset that the Crow Nation Legislature, with support from Old Coyote, approved reductions in tribal severance and gross proceeds taxes on Westmoreland Resources’ 10,000-acre Absaloka coal mine, which is on the reservation near Hardin. Some tribal members charged that the agreement was reached without public notice or hearings, in violation of the Crow constitution. There were similar complaints regarding negotiations with Westmoreland over the destruction of a prehistoric bison killing grounds within the boundaries of the coal mine. White said Old Coyote removed her and others from council of elders after they signed a petition demanding to be involved in those negotiations. The protest at the BIA was meant to remind the federal agency that it has oversight authority on matters involving tribal cultural resources, and it appeared as though the coal-tax reductions could not go into effect without being approved by the BIA. In the absence of communication with tribal leadership, there were widespread rumors that a monetary settlement over the Sarpy Site, as the killing grounds became known, was somehow tied to the decision to reduce Westmoreland’s mining taxes. Former Tribal Chairman Cedric Black Eagle, who attended the protest on Thursday, said every tribal member over the age of 18 should have been notified and consulted in regard to plans for the Sarpy Site, where extensive bone beds with apparent ceremonial significance were destroyed. Emerson Bull Chief, the Crow tribal historic preservation officer, also attended the protest and gave members of the media a press release from the Crow Tribe executive branch. Bull Chief said the reclamation would be based on extensive photographic and documentary records of what site looked like before it was disturbed. Based on that recommendation, the release continued, Old Coyote opened discussions with Westmoreland Resources, and “the parties agreed that the site will be reclaimed” by the Historic Preservation Office and will not be mined. Bull Chief also said that the tribe has not talked with Westmoreland about paying for damage to the site. Finley scoffed at the notion of “reclaiming” the site. Because huge amounts of bison bones were removed with a backhoe, along with arrow and spear points arranged on top of the bones in some sort of ceremonial fashion, trying to re-create the precise arrangements would be pointless. “They can do it, but it wouldn’t serve any scientific purpose,” he said. Bull Chief, for his part, said “Chris Finley basically politicized this whole thing in the last election,” implying that he was doing so again. Tribal elections are Saturday. After the gathering at the BIA building, organizers had plans to protest later in front of the Judge Jameson Federal Building at 2900 Fourth Ave. N. That building houses the Billings office of U.S. Sen. Jon Tester, who sits on the Senate’s Committee on Indian Affairs. One tribal member protesting at the BIA office was Frank Plain Feather, who said he worked for Butte-based Indian People’s Action. He said he was opposed to the reduction in taxes for Westmoreland, brushing off as “scare tactics” the company’s threat to close the mine unless its taxes were reduced. The company ended up with reductions in severance and gross proceeds taxes that will total $1.50 a ton in 2017. The average output of the Absaloka Mine is 5.5 million tons a year. And though Plain Feather didn’t like the tax cut approved by the tribal legislature, he also blamed the Obama administration for environmental restrictions that Plain Feather said directly threaten the Crow tribe’s ability to profit from natural resource extraction. That’s why, even though he described himself as a lifelong Republican, Plain Feather said he was planning to vote for Donald Trump for president next week. He said he sees Trump as “a Rockefeller Republican,” basically a member of the liberal wing of the GOP. This story originally appeared on Last Best News.